The requirements for TV displays are made ever more demanding by technologies such as High Dynamic Range (HDR). The risk of putative burn-in is of particular concern to TV customers in the premium segment. To see if displays stand up to the exacting performance requirements, the TV experts from video and connect Testlab carried out certification test based on the Information Display Measurements Standard (IDMS), an international norm for panel measurements, and concentrated on QLED TV’s HDR content display quality. In the case of some display technologies, memory effects will start glowing after one minute of TV use if static picture elements are shown on their screen in high luminosities. In the test, the TVs were therefore made to display a checkerboard pattern for deep black and very bright white values for longer periods of time. 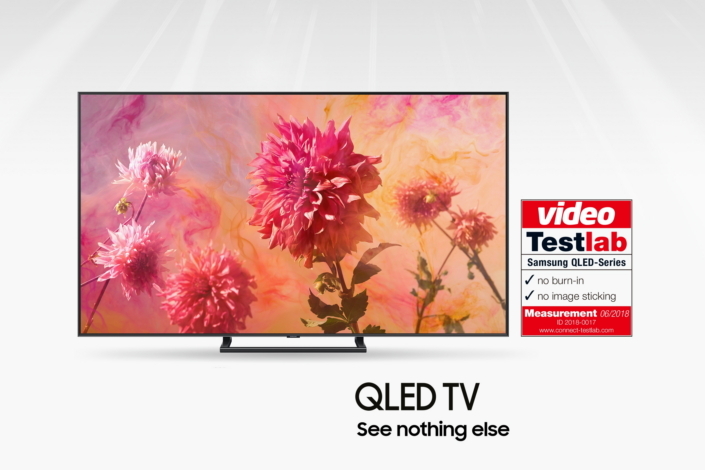 The test engineers added variable text elements and an intermittently blinking white frame to the test picture so that the automatic stills detection customary for modern HDR TVs could not spring into action. This helped the testers create similar conditions as in HDR games. In addition to the standard analysis, the testers used dark gray images with brightness values of 10 nits– which will show if dark pixels are brightened up. 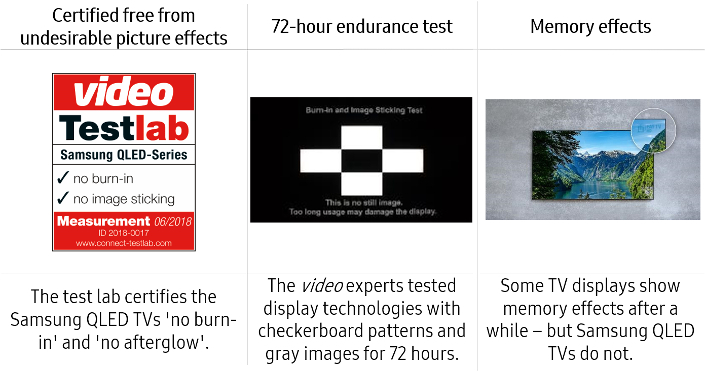 “Anyone who is particularly sensitive to ghost images and unwilling to run any risks over many years of use will be on the safe side with LCD or QLED, respectively,”2 conclude the test experts. 1 All test criteria can be viewed at https://www.connect-testlab.com/. 2 “Technik Extrem – Hilfe, es brennt (ein)”, video, issue 8/18, p. 58. All quotes are taken from this article.